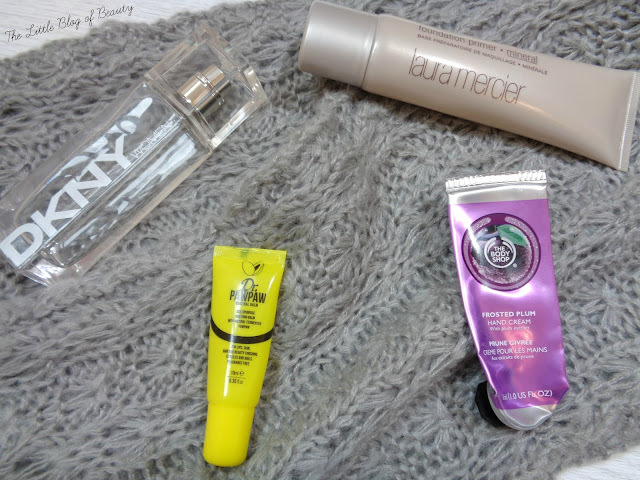 Empties posts are not something I personally tend to do as I rarely use up products. Although I could save up the empties until I have enough for a post I just don't have the room in my already overflowing bedroom to have a stash of empty packaging taking up space. When two of my cleansers both ran out at the same time I snapped a picture thinking I'd keep it just in case. I then noticed I do actually have several other products that will shortly be running out. Not all of these are completely empty just yet, but I will be finishing them off in the near future. Clinique liquid facial soap extra mild £16.50 This was one of a couple of skincare orders from House of Fraser last year using the gift card I won in the BAFTA competition. I wanted a new cleanser and had used this before and quite liked it and as there wasn't many cleanser options from House of Fraser I decided to repurchase. 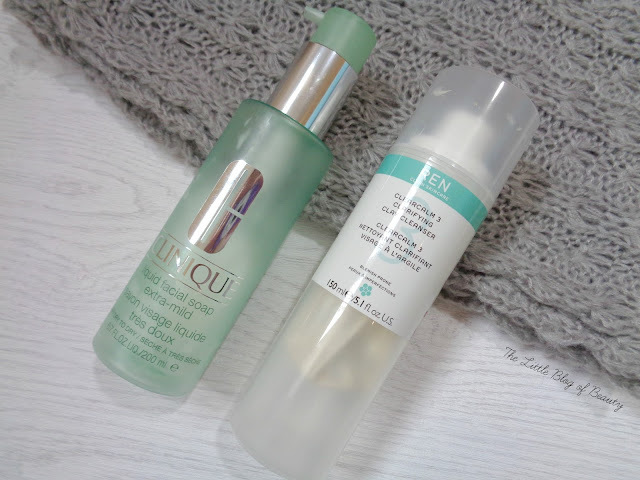 I was a little confused though as I'd previously used the mild version, which was like a liquid soap, whereas the extra mild version is actually a cream cleanser. I've been using this as my morning cleanser and evening second cleanse paired with my Magnitone and although it's a nice cleanser it's not super exciting. Repurchase? Not right now but in the future yes possibly. REN Clearcalm 3 Clarifying Clay cleanser £19 I love this cleanser and featured it in my blemish fighting skincare post. I was concerned this would be too drying on my dry skin but that wasn't a problem at all, in fact it leaves my skin feeling soft, and I found it really helped to prevent and also help treat breakouts. As the name suggests it also helps to calm any redness I have. Repurchase? If I could afford it right now I'd repurchase right this second. DKNY Women Eau de Toilette (prices vary) DKNY Women is one of my all time favourite fragrances but because of being a reformed perfume addict and being on a perfume ban (that I'm no longer on after ditching most of my old perfumes) I hadn't bought a bottle for years. When I saw the 30ml size on offer for I think £14 I had to grab a bottle for old times sake. I have noticed that this often appears to be reduced so I am a little worried it might be heading towards being discontinued. Although I still love this I was disappointed to find it really didn't last very long. Laura Mercier Mineral foundation primer £29 I won this primer as part of a prize bundle from Laura Louise. Prior to this I wasn't a fan of primers as they did nothing for me but this one showed me what primers can do and is my current favourite. The only issue I have with this is the squeezy tube doesn't always work well for me as the product settles when it's on it's side so I have to shake it down towards the nib and then often when I squeeze it too much comes out. Repurchase? Yes in the future when I've tried out a few others I have first. Dr PawPaw Multi-purpose Soothing balm £6.95 This is a mini version I was sent as a sample rather than the full size worth around £7. This is a multi-purpose balm that can be used on lips, cuticles, dry skin etc. This is amazing for all of these purposes but recently this has been my go to product for my dry chapped lips as only this, the Pixi shea butter lip balm and Nuxe Reve de Miel have been able to tackle them. There is a little still left in this but the packaging has actually split meaning it comes out of the side rather than through the dispenser, which is a little annoying! Repurchase? I've already repurchased the red version. The Body Shop Frosted plum hand cream £4 If you've been reading my blog for a while then you probably know these are my favourite hand creams and I've mentioned them several times in posts, so I won't say much here. Repurchase? Frosted plum was a Christmas limited edition but I repurchase the permanent scents regularly.